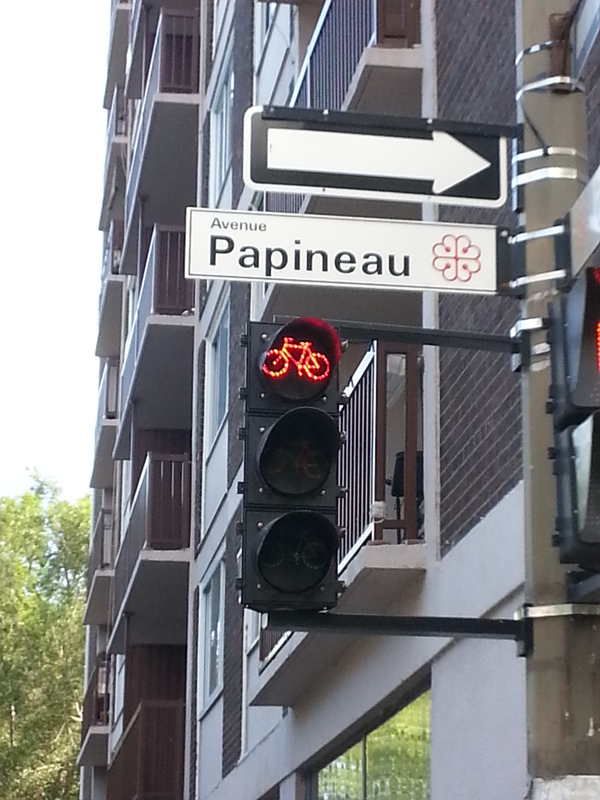 I just returned from a glorious cycling mini-vacation in Montreal, one of North America’s premiere cities for bicycling. I got to see a lot, compared to what pedestrians get to see; I got to see details that those who drive around miss; I got fresh air, sunshine, exercise and contact with locals. What Montreal got from me was tourist dollars, good will, great word of mouth and someone likely to return for more. 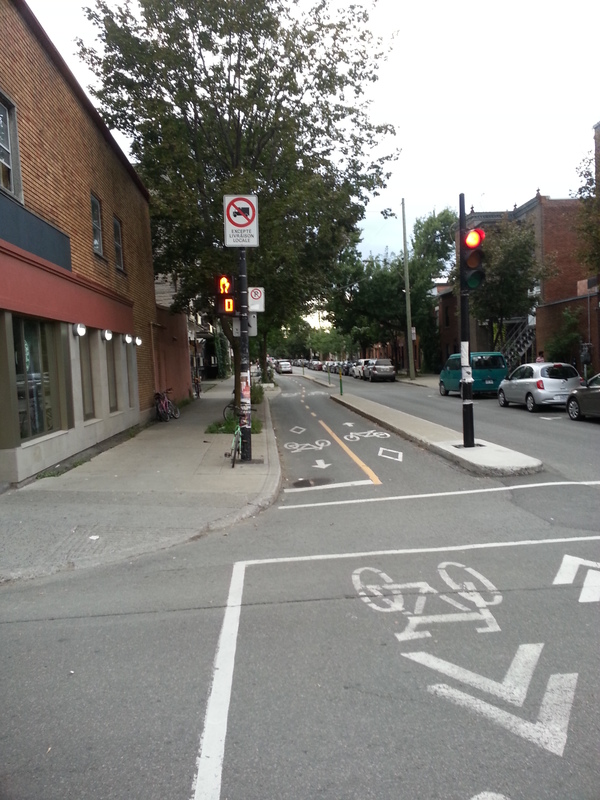 By accommodating cyclists, in addition to other tourists, Montreal has spawned a whole industry of businesses that support them – hotels and inns near bike paths, bicycle shops, and the like. It has provided its residents an outlet for safe, outdoor, healthy recreation. 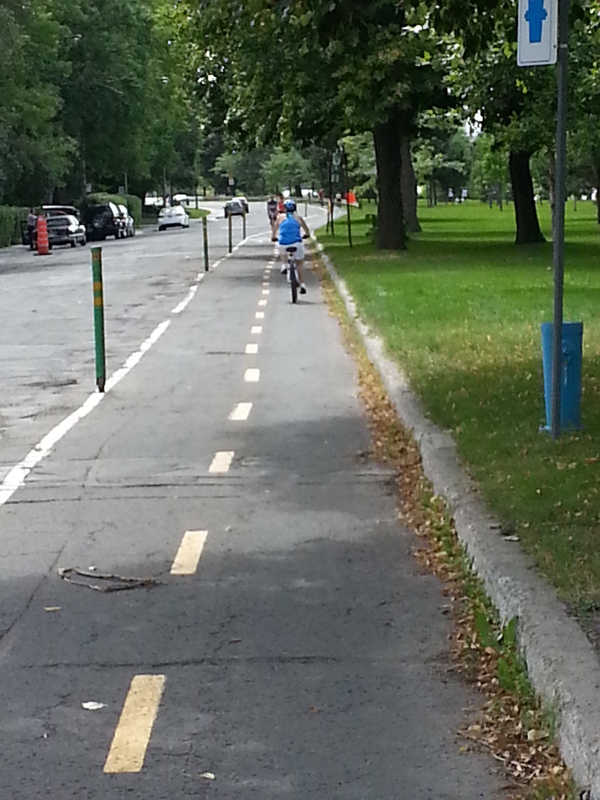 And it has created a mini-boom in real estate along the major bike routes, such as the Lachine Canal trail. By contrast, let’s look at what our area is doing to promote tourism and economic development: a convention center and a casino resort, neither world class, and therefore neither likely to attract visitors from outside the region. Both are late-comers in declining industries that already have excess capacity. While both will create one-shot jobs while they are being built, neither is likely to spur much ongoing development in their immediate surroundings, and neither will provide ongoing entertainment or recreational opportunities for locals, except perhaps for the casino, which may not be a good thing. 1. Low cost. The bedrock principle for encouraging people to bike is to provide an area physically separate from automobiles in which they can feel safe and comfortable. “Sharrows,” and bike route signs, the principal things our government wastes money on to promote cycling, do not achieve this goal. However, there are relatively easy and inexpensive ways to separate cars and bikes. 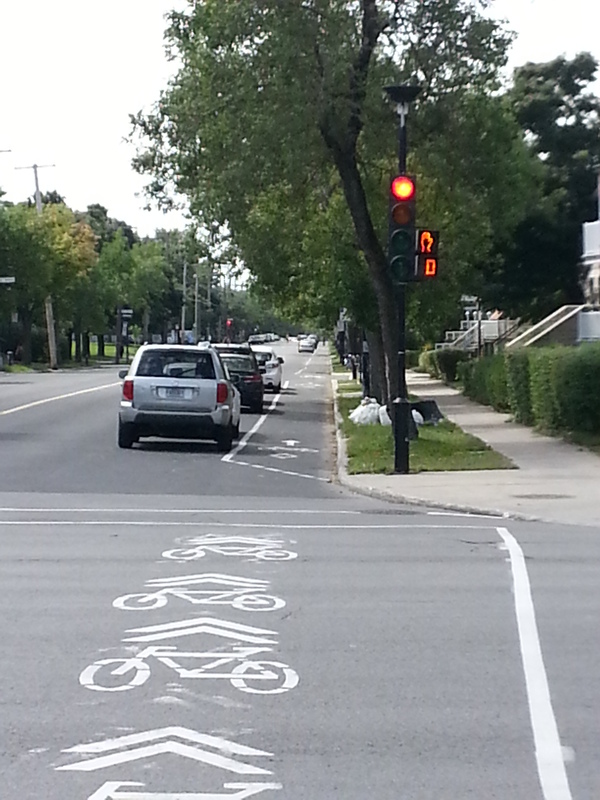 Here’s a bike path in Montreal that uses no more than a painted line to demarcate a bike lane next to the curb, with cars parked on its outside to shield the cyclists from moving traffic. 2. Benefits to residents. While attracting tourists, a usable network of bike trails will at the same time encourage locals to use their bikes more, which will improve their health, reduce automobile traffic and its negative side effects (pollution, accidents, use of large swaths of downtown land for parking lots, etc.). 3. Economic development. Bikeable cities attract millenials and others who prefer urban, car-less environments. In Montreal, I saw a lot of new residential development next to the major bike trails, as well as renovations of older warehouses, factories and the like into apartments and condos. Montreal has as long and severe a winter season as Albany, yet it proves that bike paths make economic sense even when used only part of the year. One advantage Montreal does have over Albany is more level terrain, but there are plenty of potential routes here that would not require major hill climbs. The Corning Preserve and Mohawk bike trails already here are a good start that demonstrate the local demand for off-road cycling facilities, so there is little risk that if we build it, no one will come. Expanding our network of off-road bike routes would be a win-win for residents, tourists and local businesses, at minimal cost to government. There are few greater opportunities for government to do so much good for so many at so little cost. What’s stopping it? This entry was posted on Monday, September 1st, 2014 at 3:21 pm and is filed under public health, Public places, Uncategorized. You can follow any responses to this entry through the RSS 2.0 feed. You can leave a response, or trackback from your own site.